It is located in southeastern Spain, in Andalusia. 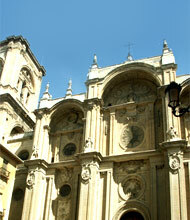 Granada is the third-largest university city in Spain (with over 70,000 students). The city is a UNESCO World Heritage Site. The Costa del Sol, with its beautiful beaches and exciting nightlife, are under an hour away. Situated at the base of the Sierra Nevada Mountain range, Granada is a great place to enjoy sport all year round; the winter months are great for skiing while summer is the perfect time for hiking. The city is near other southern Spanish cities such as Seville, Almeria and Cordoba. With Granada as a base, you can visit more of Spain without travelling too far. Granada is a UNESCO World Heritage Site, boasting both the Albaican (city's old Moorish quarter) and the Alhambra (a beautiful Moorish palace-fortress). As Granada was the Iberian Peninsula's last standing Moorish capital, to this day the city displays many Moorish remnants such as the palaces and architectural details around the city, as well as treasures from the Christian Renaissance period. The city is the capital of its southern Spanish province, also named Granada and found in the eastern area of the Andalusia region. The area features rich geographic diversity, famous throughout Spain for its stunning beauty. Not too far from the city itself lies the southern coast of Spain and its warm climate. Also nearby lies an extensive mountain range, where Mulhacen peak (the highest point of the Spanish mainland at 3,481 m) towers above the peninsula. 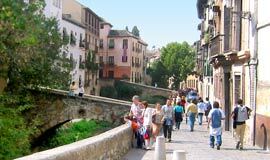 The city itself is situated at the base of the Sierra Nevada Mountain Range, at the intersection of the Genil and Darro rivers. The city's unique history as the Iberian Peninsula's last Moorish capital lives on in the artistic architectural designs of its Moorish palaces and Christian treasures, both powerful symbols of Granada's past and present. Granada not only has steep winding streets that invite visitors to explore, but it also offers marvelous natural landscapes - both the Alhambra fortress and the old Albaicín district were established on hilltops. The new section of Granada lies on flat land, where broad avenues Gran Vía de Colón and Calle de los Reyes Católicos crisscross the bustling streets surrounding the Cathedral. The city of Granada has a long history. While there is speculation of a Roman settlement there, the area experienced Phoenician, Greek, Punic and Visigothic influences, and likely many more. The Moors came to Spain via Gibraltar in the year 711 after conquering large parts of the Iberian Peninsula. They settled on top of the hill of the Alhambra in what at that time was a Visigoth town. Like many other settlements in southern Spain, they erected defensive walls and established the structure for the thriving civilization that was to follow. The city evolved over the centuries, incorporating the Jewish settlement 20 miles north, and expanding its influence. Granada flourished after the Caliphate of Córdoba fell and the Nasrid dynasty was founded in 1238 by Mohammed ben Nasar. The kingdom of Granada would go on to rule a vast region that stretched from Murcia to Gibraltar. 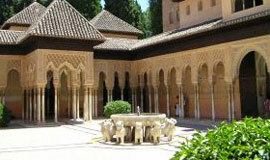 The rich Islamic culture thrived here for 3 centuries, and gave Granada the architectural marvels it still bears today. In 1492, King Boabdil surrendered Granada to the Catholic monarchs Queen Isabella and King Ferdinand, thus ending the period of Islamic rule on the Iberian Peninsular. Today, Granada still bears architectural remnants of its Moorish history, most notably in the UNESCO World Heritage Sites and the Albaicín and the Generalife. Día de la Toma (Day of Surrender) is celebrated on the 2nd of January as the day Granada was surrendered to the Spanish Catholic Monarchs. San Cecilio, the city honors its patron saint on the first of February. On this day, Granada's residents and visitors walk together in a procession, many wearing colourful clothing, which leads them up Mount Sacromonte. Semana Santa is an important religious celebration that takes place all over Spain, but Andalusia has a special reputation for its processions and traditional festivities. The Holy Week of Easter is very important to the Catholic faith here. On the third of May, Dí­a de La Cruz is a celebration to herald spring, with colourful celebrations throughout the city. Corpus Christi is celebrated in June. Marked with a week-long market, there are also celebrations throughout the city and in the towns surrounding Granada.